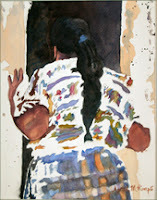 Stopped to Chat was inspired when I was in Comalapa, Guatemala. Watching the people come and go to the market allowed me to see everyday life in Guatemala. This woman stopped on her way home and poked her head into the building next to me. The wheelbarrow contained her goods from the market. I don’t know her purpose, whether a friend or family member was there but I had the sense she was enjoying herself. This everyday moment was special to me and I wanted to share it with others. I wanted to emphasize the patterns in her dress by focusing on the edges. To have a consistent painting that mean emphasizing edges throughout the painting. I decided retaining a lot of the white of the paper was a good method to allow me to do just this. At the end of the painting I then added mid to light valued shapes into some of the open white areas to introduce paths into the painting and consolidate interest in the center where the woman was standing. 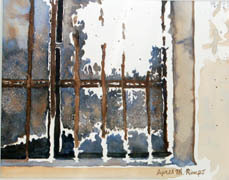 Interesting pattern areas, like the window, were important to balancing the painting. I used variations of grays so they would be interesting counterpoints but not distract from the woman. Since the wheelbarrow with the clothes and cloth were in the foreground I felt I had to maintain some greater color variation, but I didn't want these to be too interesting. I muted the colors by placing them in the shade and emphasized the folds to ensure they were recognizable as cloth. I felt her skirt was the riskiest part of the painting since I wanted the edges to look like little threads were protruding into the white around her. I had an idea for a technique but wasn't sure whether it would work, so I decided to do a few studies to practice. The three studies are shown below. First I painted Looking Inside (watercolor, 10" X 7.75") using an old fan brush I had used with oils to create the little lines of cloth. As long as I used the brush immediately after applying the paint the technique worked. In addition I had sprayed tiny droplets of masking fluid over the skirt to create little white spots that simulated the lighter threads in the fabric. Next I decided to paint Rustic Window (watercolor, 10" X 7.75") to make sure I could get an old look that was consistent with the rest of the painting. 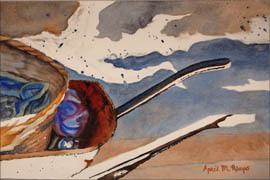 The last study was Wheelbarrow (watercolor, 8.5" X 13"). In this one I was practicing a minimalist handle and creating the texture of the basket. 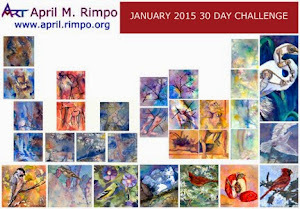 Once I had completed these studies I knew I was ready to paint Stopped to Chat. Although I know it is sometimes best to practice before diving in, this is risky for me because I tend to be restless and want to move on to something knew. In this case the variety of techniques kept me interested in still painting Stopped to Chat after the studies were done. I'm glad I persisted. Copyright April M Rimpo, All Rights Reserved. You may share my work with attribution and a link to this source site, but all other uses are prohibited. 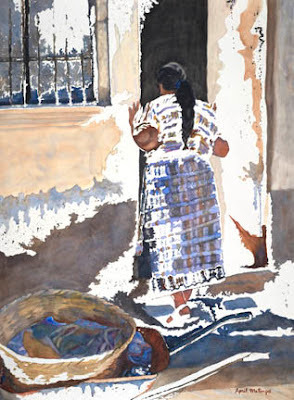 "Wash Day", 14.5" X 34"